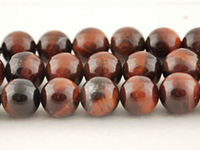 Red tiger eye is a chatoyant gemstone that is a member of the quartz group of chalcedonies. Red tiger's eye is mined in Western Australia, South Africa, USA, Canada, India, Namibia and Burma. 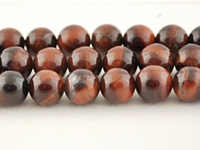 Metaphysically, tiger eye stone brings energies of vibrancy, vitality, enhanced integrity and feeling more grounded. This 4mm round red tiger eye semiprecious stone bead with a dark red color is for sale online in the natural gemstone beads section at the Harlequin Beads and Jewelry bead store.